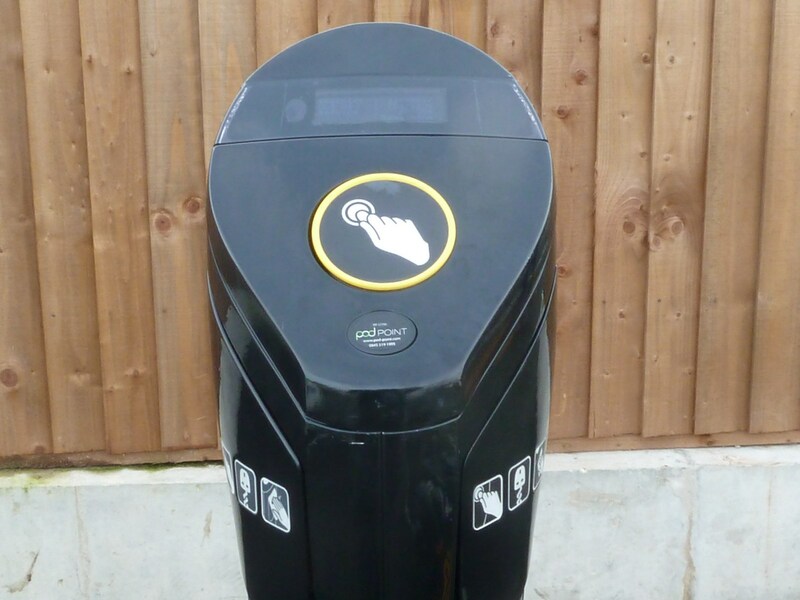 In early 2011, after I’d enthusiastically set about putting my bike through just about every possible upgrade, it soon dawned on me that provision for public charge points in the UK is pretty non-existent. 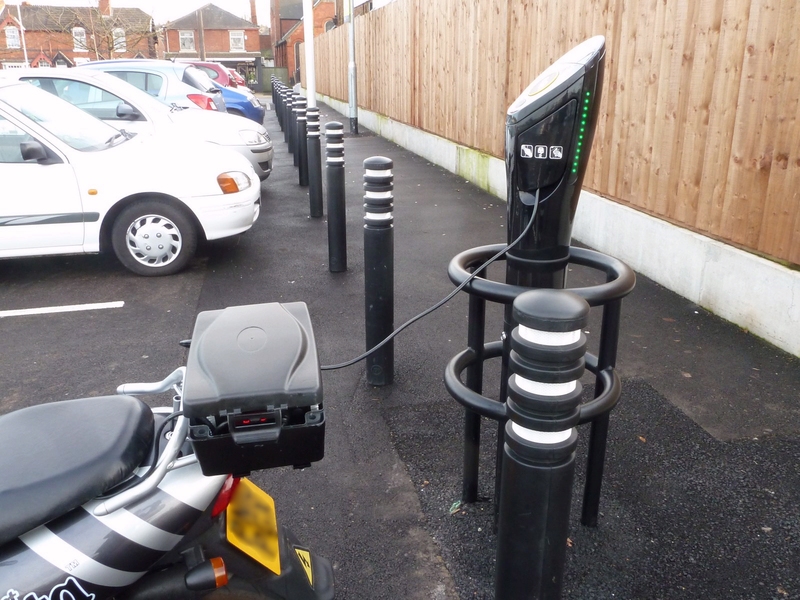 Though they have a park-and-charge scheme in London, it is a struggle to find any public charge points anywhere else. I met with my local MP (member of parliament), Sir Alan Meale to get some advice on how to go about getting more of these things available to the public and – as a campaigner with a long history of pursuing environmental issues – he had lots to say about what needs to be done to get more of this type of service put in place. 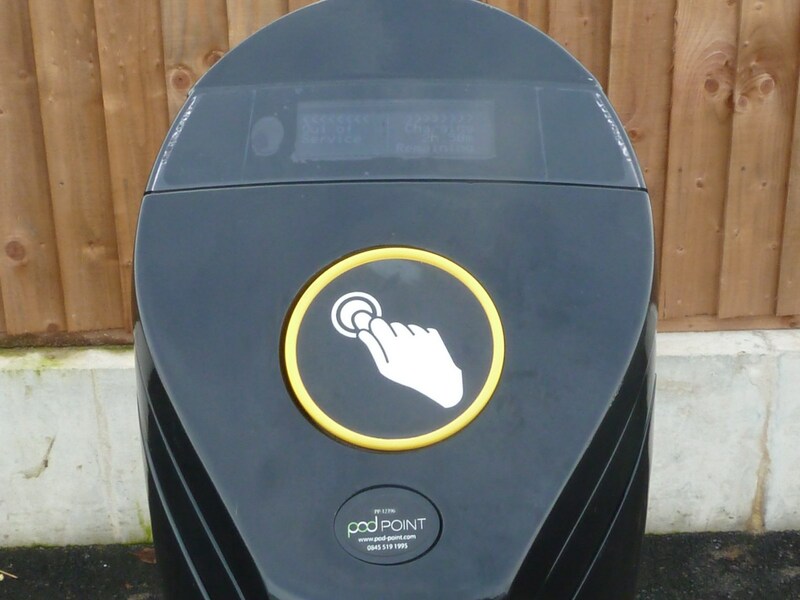 The key, he said, was to target planning proposals for new developments and file an objection to plans for any car park that does not offer a charge point. Planning applications are posted in everybody’s local newspapers, and the process of local consultation is usually well organised, with council websites offering full electronic details of applications and plans, with the option offered for any members of the public offer their objections to any part of that development. These objections are all then addressed in a committee meeting between council officials and developers, with issues being discussed, and modifications being made to plans accordingly. Practically every town in the country has some kind of big, commercial development in progress, with supermarkets like Tesco, Sainsbury and Aldi (here in the UK) rolling out huge new sell-it-all style warehoues of the kind we’re becoming increasingly accustomed to. The building spree of these growing commercial empires, though, offers perfect opportunities for electric motoring enthusiasts to take matters into their own hands by simply hunting down the relevant planning applications and complaining about lack of provision for motorcycles in general, and for electric vehicles specifically. So when my MP reminded me of a massive, joint Sainsburys/Aldi development that was scheduled to replace a smaller existing Sainsbury’s, I did as he instructed and tracked down the plans for the development. The plans incorporated an impressive, 400 bay car park. 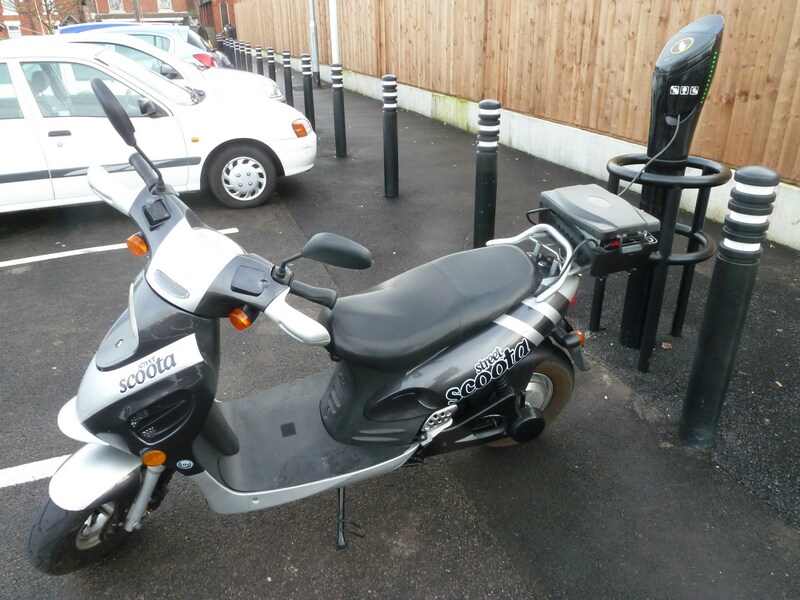 So I formally filed an objection on the grounds that a) the parking development did not make adequate provision for motorcycles, and b) that no charge points were available for electric vehicles. I also wrote a letter to Sir Alan asking him to support my proposal for the plans to be amended to include these provisions, which he duly did, sending a letter to the committee dealing with the proposal. I thought nothing more of it, and had totally forgotten about it when a few months ago a family member reported seeing a charge point in the new development. Here it is! It’s activated by a little card that you get from staff in the supermarket. You wave the card across a little panel on the unit to release a flap on either side, each of which houses a regular, 240V power point. If you look closely at the picture you can make out a little display counting down 3 hours, which is the amount of time I’m allowed for a single ‘session’. Here you can see the charge point in action with my custom charger top-box. It just so happens that my bike will charge from flat in 2 hours 50 minutes, so 3 hours is more than I’ll need for a good top up while shopping. So my little town is now host to the second of only two power points that exist within about a hundred miles of here! Want one in your town too? If my story is any guide to how easy it is if you go through the proper channels, then all you have to do is a little homework, and some letter writing. These things aren’t going to just pop up all by themselves, YOU can get involved and be part of the electric motoring revolution. 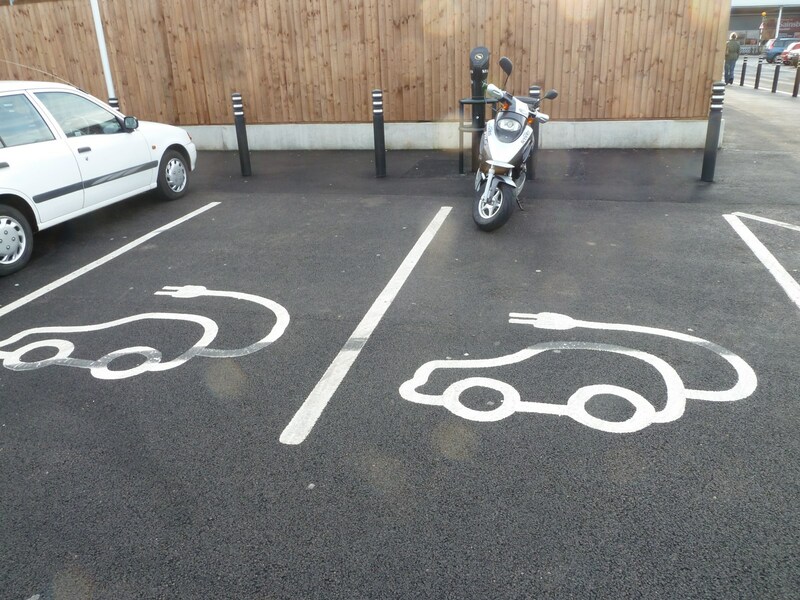 I appeal to all electric vehicle owners in the UK and elsewhere – both as motorcyclists and as electric vehicle enthusiasts – to actively seek out and file objections to local developments with “car” parks (just the fact that they are called “car” parks speaks volumes about the prevailing attitude towards motorcycles, any pedants here might also suggest that the authorities start referring to them as “parking areas”). 3) Forward a copy of your request to your local MP asking him/her to support your application in writing. A meeting is usually called to discuss the proposal, and the public is invited. I didn’t make it to mine, but it evidently didn’t make much of a difference. You are currently browsing the Zenid's Ego Scoota Blog blog archives for April, 2013.